Trivia: The photo of Nicky in her confidential file is actually a promotional shot taken of Julia Stiles (Nicky) in 1999 for her movie "10 Things I Hate About You." Trivia: In the scene when Bourne takes John Nevins and a security guard down after being captured in the consulate, Matt Damon accidentally knocked out Tim Griffin. Trivia: In the end credits, the Marines are listed as "Jarheads". Kirill: You told me I had one month off. Gretkov: You told me Jason Bourne was dead. Marie: Because sooner or later, you remember something good. 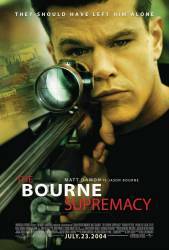 Jason Bourne: I do remember something good. All the time. Question: When Bourne interrogates Nikki (under duress) in the underground station, Nikki insists that Bourne had never worked in Berlin, much less completed his first mission there. But it is established that Bourne had killed the Neskis in Berlin on what is described by Conklin as his first mission. Assuming Nikki has no reason to lie and that she would have accurate information about Bourne's activities, what might explain that issue? Chosen answer: Conklin ordered Bourne to kill the Neskis, telling him it was a training mission, when in fact it was an unofficial, off-the-books assignment to cover up his and Abbott's corrupt dealings with Gretkov, which Neski was about to expose. Nicky did not know about this Berlin mission as it was not an official Treadstone operation. Conklin did not tell Bourne that it was a training mission. Conklin told Bourne "this is not a drill soldier...this is a live project, you're a go." By "not a drill" and "live project", Conklin is telling Bourne to actually kill the Neskis - like killing the hooded man for Hirsch, it's training him to do anything for Treadstone. It could be that the edit is out of chronological order, but the order of the scenes implies that after Bourne has done the job and returned to the car, Conklin says "Congratulations, soldier. Training is over." Question: Abbott and Gretkov could have framed anyone else for stealing the Neski's file, why did they frame Bourne whom they knew well was a tough cookie? Even if Kirill was successful in killing Jason right from the beginning, it took a lot of effort to do so. Chosen answer: They frame Bourne because Borne was actually the one who killed Neski and his wife (he was doing it on Conklin's orders). Once Pam Landy does some digging, she will realize this; then it's a simple matter of putting two and two together - the man who killed Neski would obviously have a huge motive for covering up his crime. This is why Abbot and Gretski frame Bourne: he's the perfect fall guy.